The 'Secrets' includes a section on healthcare. Here 'Aristotle' advises the king to get a second opinion: "do not place your confidence in only one doctor." 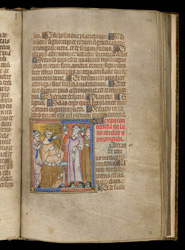 The illustration shows 'Aristotle' and the king before two physicians, who hold up specimens or medicine in green vials to examine them.